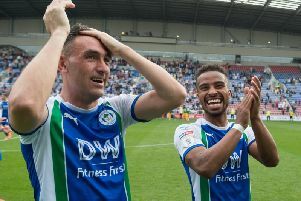 Wigan Athletic legends to face Manchester United greats! The Latics Legends are set for their biggest challenge yet – with mighty Manchester United providing the opposition for this season’s Joseph’s Goal showpiece at Ashton Town FC! Organisers have pencilled in Saturday, May 25 for the annual fundraiser for the Wigan-based charity, which has quickly become an integral part of the calendar. Previous opposition has included a Hollyoaks XI, Arjan de Zeeuw’s Dutch Masters and, most recently, Manchester City. And it’s now the turn of United to try and get one over a Latics side which will once again be jam-packed full of familiar faces from yesteryear. Players from both sides will be announced in due course, but the first name on the Latics team-sheet is De Zeeuw who, after twice playing against Latics for his Dutch XI, finally gets to wear the famous blue and white. All proceeds will go to Joseph’s Goal charity, to find a cure for the rare genetic disorder, NKH. Nine-year-old Joseph was Wigan’s lucky mascot at Wembley in 2013, and the charity bearing his name funds ground-breaking research both in the UK and the USA. Ashton Town chairman Mark Hayes, a trustee of the charity, says no stone will be left unturned to make this the biggest legends game yet. “The planning for this actually started at the last legends game against City, when we had the likes of Pat McGibbon, Ben Thornley and Russell Beardsmore in the crowd, and it’s just gone on from there,” Hayes said. “I say it every year, but it really does become harder to top this game year in, year out. “Getting the Three Amigos back together was my proudest moment, and the only way we can top that is by lining up the biggest and best opposition. Participating players will be announced in due course, along with ticket details.